Last week, Auckland Council temporarily suspended the company's trial licence after safety problems with the brakes. 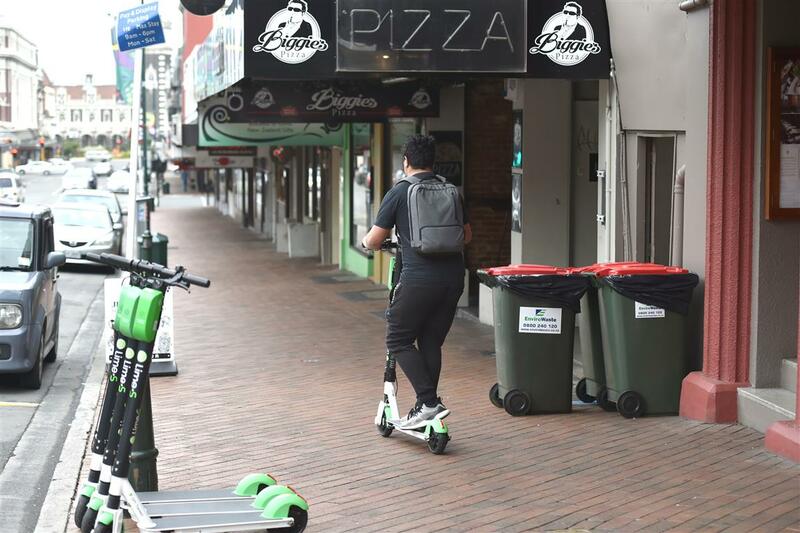 In response Lime voluntarily pulled e-scooters from Dunedin streets after discussions with Dunedin City Council. But other regions such as Lower Hutt and Christchurch aren't pulling their fleets just yet. The green scooters have proved immensely popular since they arrived in New Zealand in October but several people have been catapulted off them by a braking fault that suddenly locks the wheels. In Switzerland the company had to pull its fleet. Here, there have been 155 reports of the wheels locking. Thirty of those resulted in injury, including to Auckland man Liam Thompson who suffered a broken jaw. The scooters may be extremely popular but customers deserved better, the Automobile Association's Mike Noon said. "Imagine if you were riding a bicycle that fell apart while you were riding it, or a you were hiring a rental car that the brakes failed on?" "There is a consumer protection issue here. "You're hiring those vehicles with the understanding that they are actually sound and that they will do the job they're expected to do," Mr Noon said. Last week, Auckland Council issued Lime with an ultimatum to prove its scooters were safe and the software glitch had been resolved. By Friday, Lime still hadn't provided enough assurance and the scooters were ordered off the footpaths. Dunedin City Council followed suit, and its general manager for community services, Simon Pickford, said the council would wait until Auckland hears back before letting scooters back on the streets. There was no bylaw in Dunedin preventing Lime scooters from operating but regulation was being looked at, Mr Pickford said. "We need that conversation with the community about what they feel in terms of should [Lime] be here, and if they are here, what does that mean? "Where should they be, what speed should they be allowed. Those conversations haven't happened yet." Mr Noon said Lime scooters did have a place in the future of transport, but for now other regions should follow Auckland and Dunedin's lead. "I think putting them out there, or leaving them out there, while they do have a problem, is pretty bloody off." Acting mayor for Lower Hutt David Bassett said despite a number of complaints they would not be pulling the scooters yet. "I've asked officers for a report on this, so that's where our position is at the moment. We certainly haven't stopped them." The Hutt Council will debate whether the scooters should stay in two weeks time. In Christchurch, councillor Deon Swigs said Auckland's suspension was hasty. "I would rather work constructively with Lime, I don't want us to have a knee-jerk reaction to these issues," he said. "There are a lot of people enjoying these scooters and are having positive experiences." One person had come to him saying they had a potential brake lock-up but that was one incident out of upwards of 400,000 rides, he said. "I take that seriously, and I want to have that conversation with Lime." The community overwhelmingly supported the scooters, he said. Christchurch City Council will consider a report on the scooters on Thursday. Last week Lime said in a statement the company remained confident in the safety of its service. Its representatives met Auckland Council and Auckland Transport officials last week and the company said afterwards it was confident it would be "back on the streets of Auckland soon". Makes more sense than Cull, NZ doesn't have states, so IMO NZTA should be the authority on rules and regs for them with Councils deciding if they want to have them in a city. If a council wants a change to the rules and regs they should then apply to NZTA for a country wide change, with any changes being voted in on a majority basis. And any infringed laws being fined. The AA has a problem with anything that doesn't belch CO2 it seems. Time for those dinosaurs to recognise that cars need to be replaced by other, less polluting, transport. And CARS are safe? How many people do they kill every year?? ?